Read on for the story of their “dream trip” to Lapland—and Aik’s concluding thoughts on what is happening to the Sami, their way of life and the native landscape above the Arctic Circle. 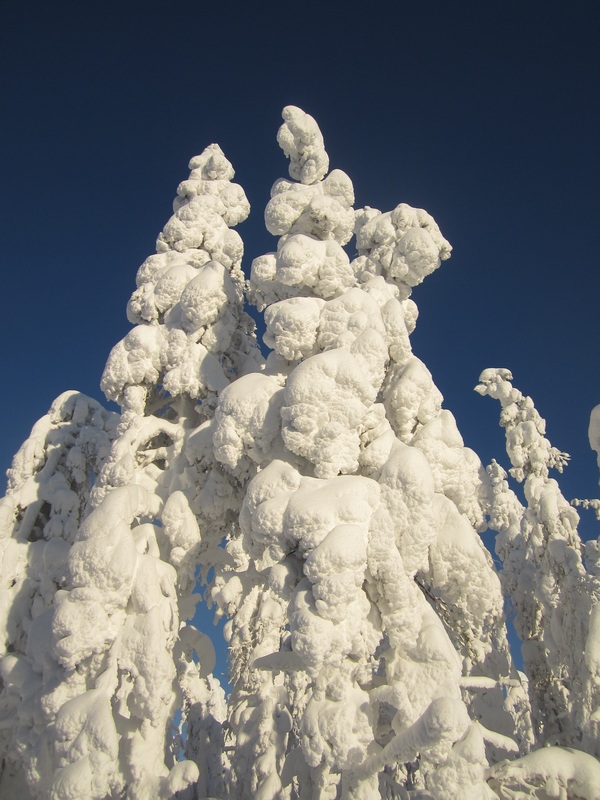 In Europe it is indeed very easy to book a trip to Lapland: direct charter flights leave from several European cities to airports above the Arctic Circle. 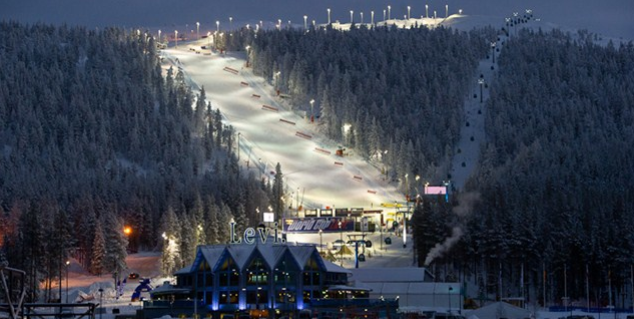 We selected a week in the Finnish Sirrka / Levi, a popular ski resort in Finnish Lapland. 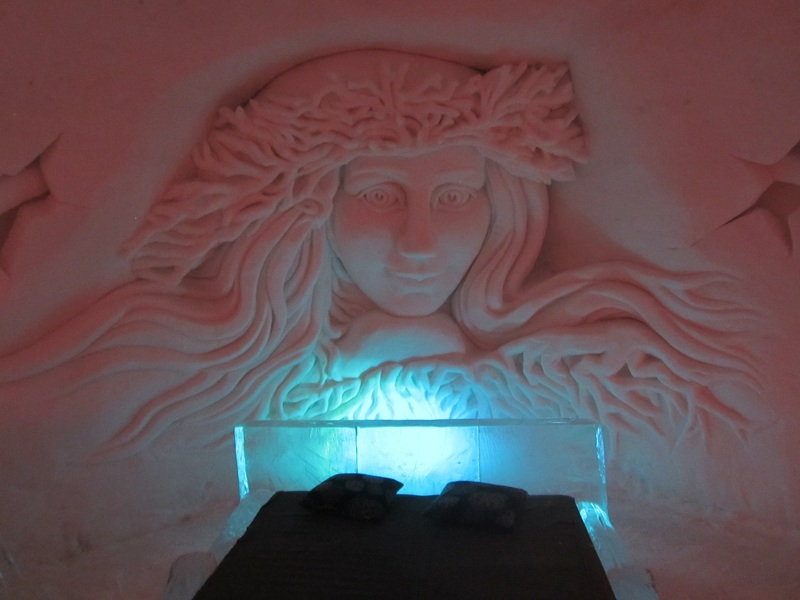 From there you can visit Lainio Snow Village – and sleep overnight in an igloo or an ice palace. From our arrival the weather was gray, with low, heavy clouds and occasional snow. Over the past few days it had snowed a lot, nearly 4 feet! For me, that is an unknown world in Holland. We were prepared for low temperatures, down to minus 40 degrees Celsius. However, the weather app forecast a week with daytime temperatures between 32 and 23 degrees Fahrenheit (zero – minus 7 degrees Celsius) and overnight between 26 – 12 degrees F ( -3 and -11 Celsius). For us Dutch, these temperatures are familiar from our own winters, but from some years ago! For visitors coming during the long, dark winter months, the resort has arranged big lampposts with bright floodlights on the mountain, so tourists can ski, even if you normally cannot see a thing. As a result, you’ll see light up the mountain in the dark and silent landscape. Around the mountain is a circular road on which the ski bus takes tourists to the different slopes and lifts. 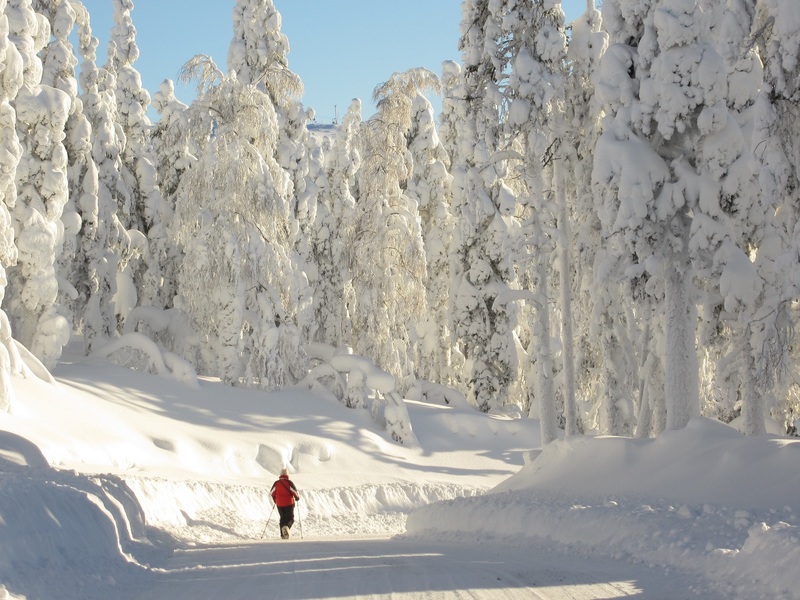 Around the village, there are 142 miles (230 km) of tracks designed for cross country skiers — wide trails of up to 26 feet make their way through the silent woods. 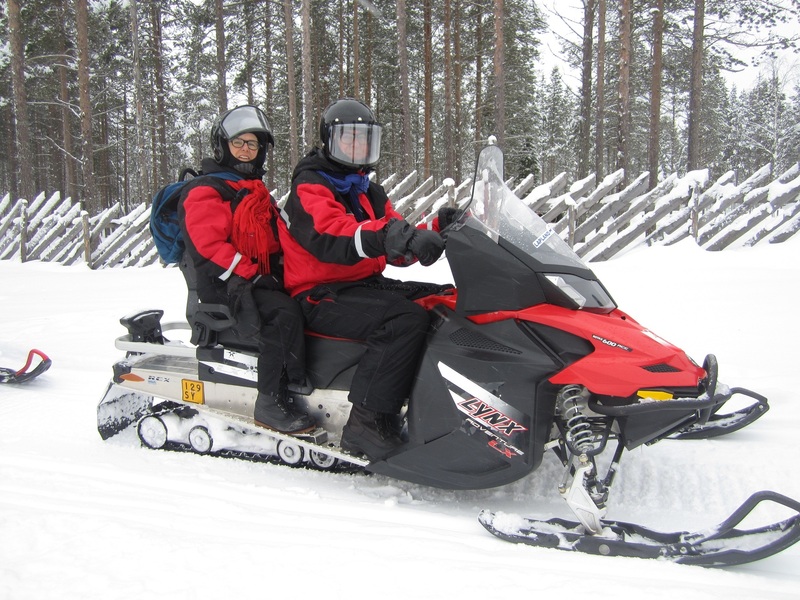 For those who do not seek silence — and especially get enjoyment from noise of roaring snowmobiles—the resort created 550 miles (886 km) in the round and to various excursion locations in the surroundings. 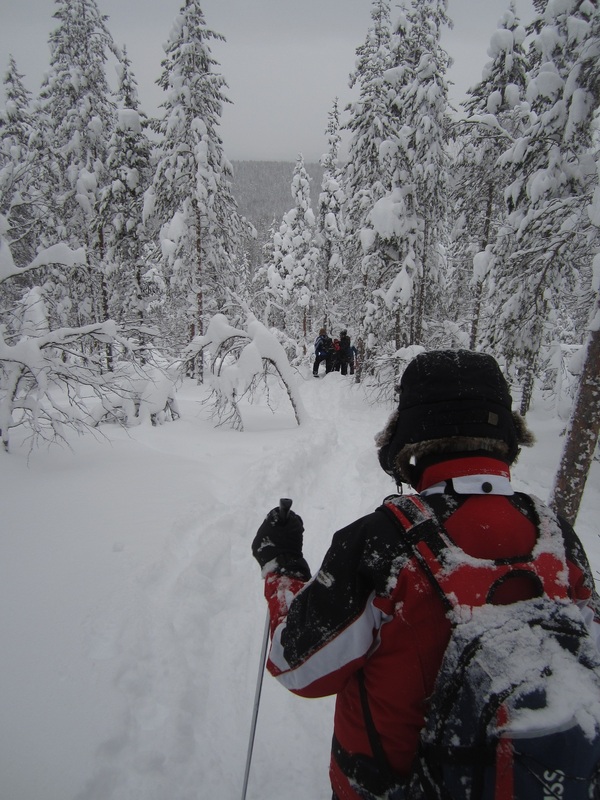 We took an excursion every day, starting with a snowshoe hike. Led by a guide, in a group of 15 people, we met for the first time in the white wonderland. It is beautiful, but also exhausting to walk with wide snowshoes on the snow. And if you fall down, it is virtually impossible to get up again, without the help of others. We also experienced a sauna sensation during the hike: our body temperature rose to above 104 degrees F; on our heads, there was fresh snow and the temperature was 23 degrees F ( – 5 C). A perfect combination to catch a cold! The second night we registered for a tour “in search of the magical Northern Lights.” With snowmobiles we traveled 9.5 miles (15 km) in the evening to a place where there’s no light pollution to conceal the appearance of the natural wonder. But on departure we already knew the sky for that evening would remain covered under heavy clouds. So few Northern Lights! But we did produce a lot of noise with 20 snowmobiles at night through a pristine area. When we drove through the forest, we had to hold down our speed for a long time: a lonely reindeer calf was caught in the bright beams of our headlamps, dazed, and kept running in front of us. 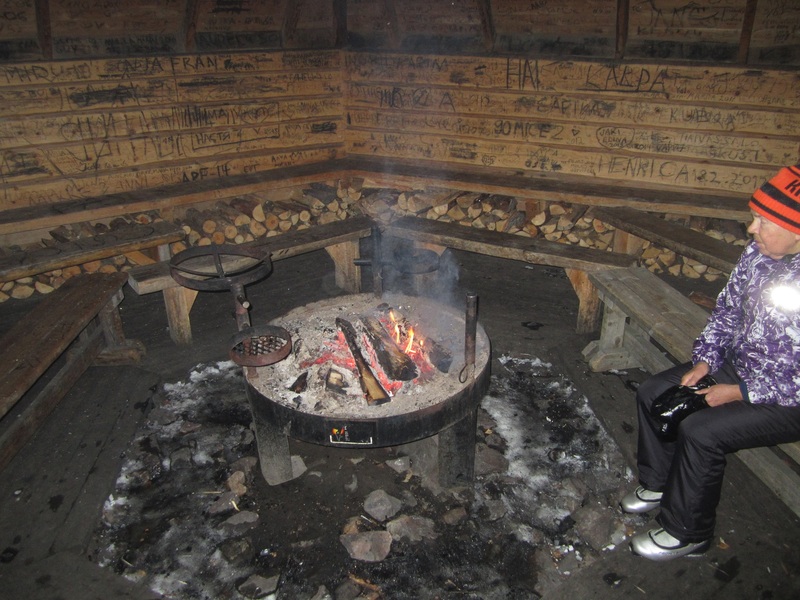 The tour ended at a tipi, made from wood and stone, with a fire pit in the middle. We got hot berry juice with a grilled sausage, and stories. For example, everyone living there carries a great sharp dagger knife in his waistband. With this knife thin curls can be scaled from a log, which they can quickly put on the fire. This is useful because everywhere, all across the country, there are tipis, containing a fireplace and logs to warm up. From the moment we awoke on the third day, the sun was shining in a clear blue sky. The view of the beautiful, snowy landscape was overwhelming. Awesome! We took the cable car up to where the trees were covered with even more snow. We could not see the green pine needles anymore, and the branches were transformed into plaster sculptures. The walk through this winter wonderland is one I will most remember. 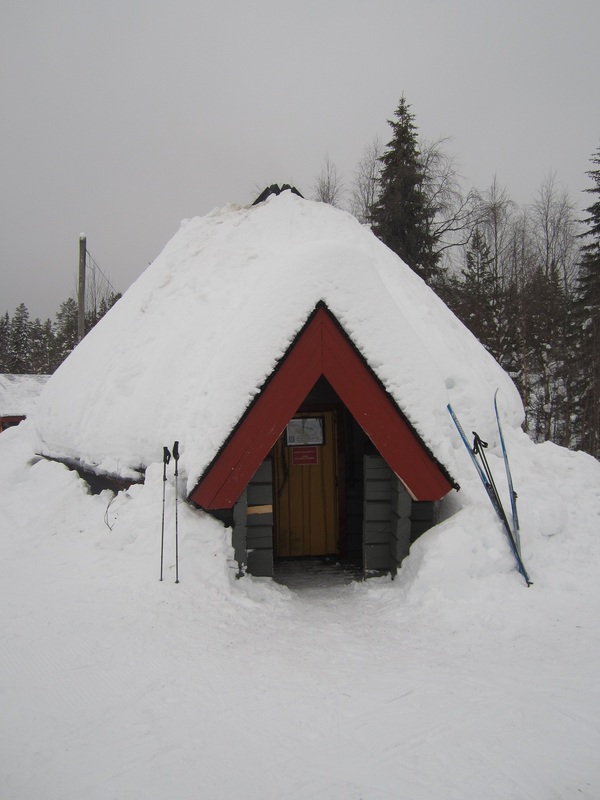 On top of the mountain, in addition to a conference hotel, stands Sami Country, a modern building that houses an exhibition on the Sami Photos, texts and objects tell the story of the Sami in an indoor exhibition. Outdoors we found several buildings as well as Sami reindeer. Samiland is part of the UNESCO Observatory Cultural Village program, a global program where with all kinds of educational and arts activities of the original people is working to preserve traditions and a sustainable future. In 1941 The Finnish government permitted the Nazi Army to station itself in Lapland as a part of Operation Barbarossa against the Soviet Union. After Finland made a separate peace with the Soviet Union in 1944, Soviet leaders demanded that Finland expel the German army. That resulted in the Lapland War, during which nearly the entire civilian population of Lapland was evacuated. The Germans used “scorched earth” tactics before they withdrew to Norway—also used elsewhere in the German retreat. The result: up to 47% of the dwellings in Lapland, 259 mi of railroads and 5,900 mi of roadways were mined, destroyed or made unusable. Some 675 bridges were destroyed. Lapland’s capital Rovaniemi was virtually burned to the ground – some 90% — with only a few pre-War buildings surviving. Sami were forbidden to teach their children their own language and wear their own traditional clothes. These rigorous measures were undone in the 1960’s and ‘70’s. In the late 20th century Lapland’s economy started to decline: mines and factories became unprofitable and the population began to decline rapidly across most of the region. Reindeer herding was restricted. Only tourism gives some new economic growth to the people and this region. In the evening we went by bus to Lainio Snow Village, 28 miles from Levi. Our package included dinner and overnight stay in an igloo. The day’s bright skies gave way to darkness upon our arrival. The driver reported with smiling eyes that we had to look at the sky, there could be the sight of Northern Lights! The sky was clear, the stars visible. In some places it seemed there were thin clouds of light gray vapor. Aurora borealis at Ukonjärvi-Inarijärvi, Finland. Clouds? But they changed shape in a way I was not familiar with –as if curtains were moving. Sometimes the light gray clouds turned a little green. But not as bright green as in the photographs and You Tube videos. No, it was less. Photographic devices seem better adapted to observe the lights than the human eye. And videos on YouTube show the Northern Lights often changing at an accelerated pace. But the realization that I was witnessing this natural phenomenon with my own eyes, gave me a sensational feeling! 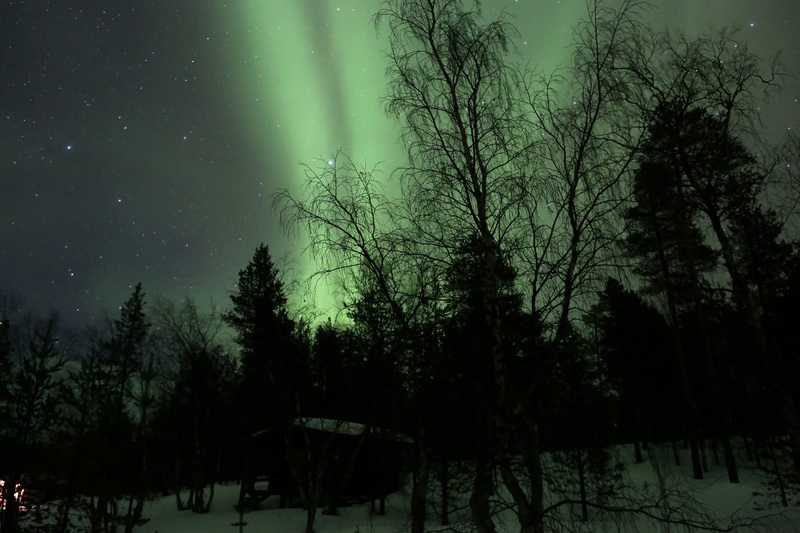 We had already encountered several people (some age 60+) who put seeing the Northern Lights on their “bucket list.” They were on their third or fourth trip to Lapland, because the natural phenomenon had not occurred for them on earlier visits. I heard that you have the chance of one in ten or fifteen to see it. So we were lucky indeed. At the entrance to Snow Village, a couple came running out the front door with the rumor that the Northern Lights could be seen. Their guests accompanied them. They had interrupted their wedding dinner to see the Aurora Borealis. Conceivably the most beautiful experience of all –to see the Northern Lights at your wedding dinner! That means when your marriage is held under these auspicious circumstances, powers will overcome all adversity during the marriage. My sister, who is an official of the Civil Registry in the Netherlands and has conducted more than 700 weddings, was especially pleased. She wanted to go by herself to experience the wedding chapel in the snow igloo. 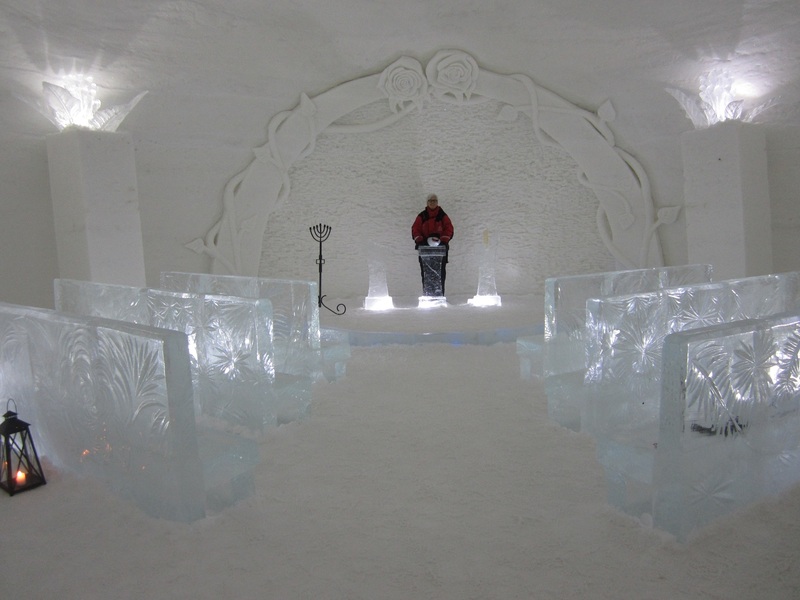 Everything in the chapel was made from ice and snow. To sit on the benches of ice, there were reindeer skins and thermo mats. Colorful lights make in the corridors and rooms in Snow Village just a fairy tale. 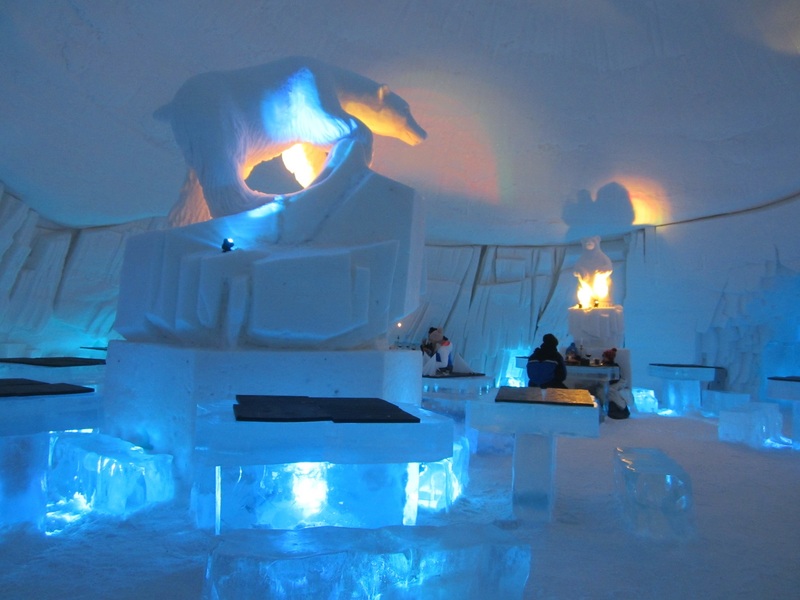 There were 27 different “sleep igloos,” a restaurant, a bar, a place for the workshop to chop ice blocks and an area for children with a huge ice slide. 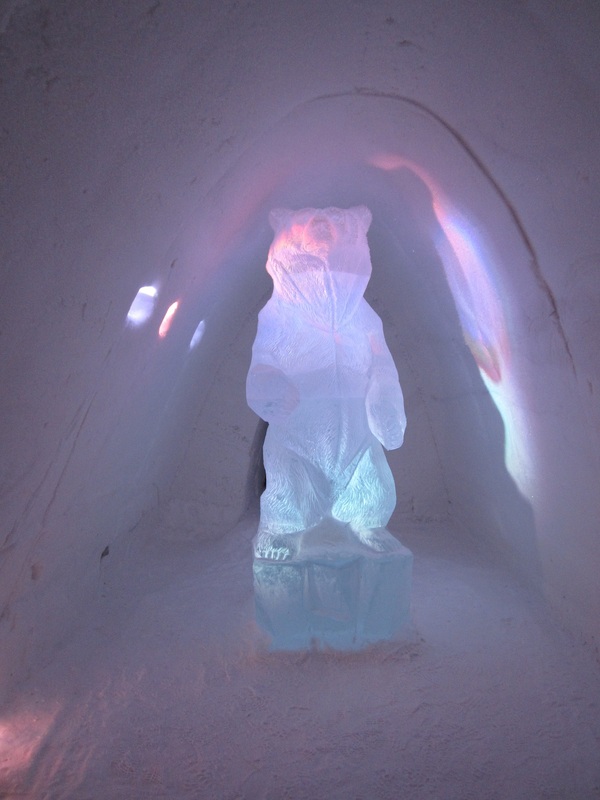 A three-meter-high bear kept watch at the end of the corridor with the sleep igloos. After a delicious restaurant dinner under the largest snow dome in Europe, we readied ourselves for the night. The bed was of ice, with an ordinary mattress. In the heated departure area, thermal sleeping bags were stored to pick up and carry to our room. Inside it we had to put a fleece sleeping bag. It is intended that you crawl into it, dressed in thermal underwear. We got a tip to put our thermal excursion overalls on the mattress first, underneath the sleeping bags for extra insulation, and bring our usual outerwear into the sleeping bag, so the next morning our clothing would not be cold. We were able to button up the bag, so only our noses were sticking out. We had a good night’s sleep in the igloo, which muffled all sounds. It got no colder than 20 degrees F ( -7 C). Only my sister had to go to the toilet at night. That meant: get out of all the bags, put on shoes and a warm sweater, walk quickly down the long corridor to the warm room with the toilet, and then back again! We approached the husky farm and heard the deafening barking –150 dogs. After a brief explanation of how you control a two-man sled, we were on our way: 15 sledges, each with six dogs in front. Once we gave the signal “Go!” they stopped barking and took off immediately. It was a wonderful trip on a road that paved especially for these tours through a pristine white landscape. Afterwards we received explanations about the dogs. There are huskies from Alaska: slim and fast; and other dogs from Siberia, thicker and stronger. 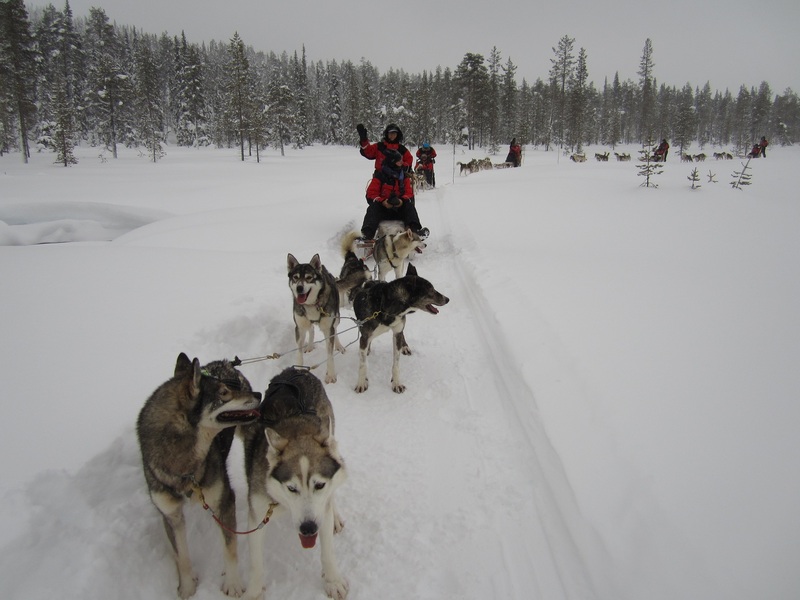 When clamping the dogs to the sled, they place the fast Alaskan dogs in front, and strong Siberian dogs at the rear. In this way, they make the best use of the different capabilities of the dogs. How long the huskies have been present in Finland nobody could tell me: I do not rule out their arrival has everything to do with the advent of Lapland’s tourism. All of the dogs are very people-friendly. But among themselves they have strong likes and dislikes. It’s a big job every time to put together a workable set of six dogs. The guys who work on the farm keep lists on paper of the huskies that quarrel all the time and those with whom they go well together. Reindeer are part of the natural fauna of Finland. The reindeer which you now encounter in the wild, however, are all tagged in the ear. They are held by someone who breeds the reindeer, especially for meat and hides. 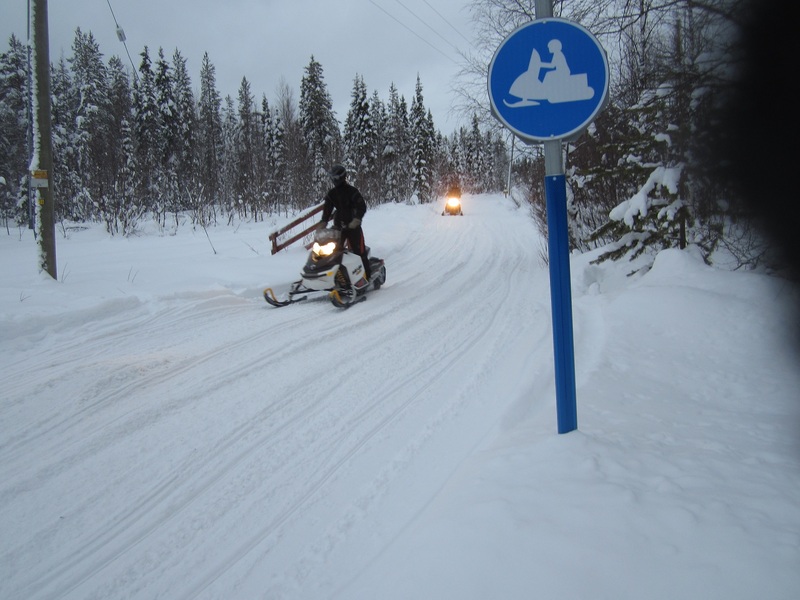 The excursion to the reindeer farm meant that we went again with snowmobiles full of noise and we polluted the clean air to cover the 15 km to the farm. Welcoming us was a Finn in traditional Sami costume. I thought of the people in Holland who dress themselves in authentic costumes to welcome the tourists in Volendam. The reindeer were tied to a sled, in such a way that they were also connected with a rope from their head to the sledge before them. That meant, when everyone was seated and the Lap gave the first animal a turn, all the animals had to move in a walking pace We walked a neat circle around the farm. I felt like a child who at the time was put in a pony cart at the fair to walk around a small circle. 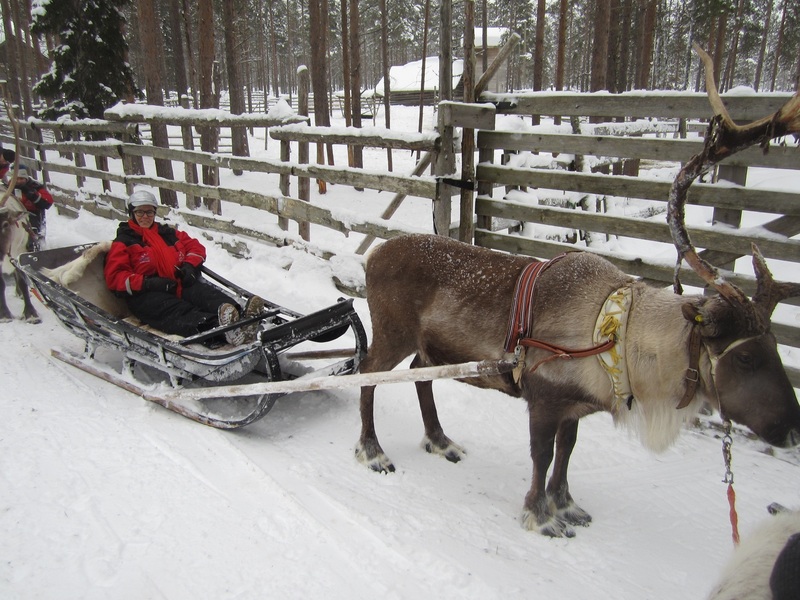 It had little to do with an authentic reindeer sleigh ride from my perspective. The best anecdote from our guide: Male reindeer in December lose their antlers; females lose theirs in spring. So Santa Claus deceives us with his “Rudolf.” It is a reindeer with antlers, so around Christmas, it must be a female: we better call her Rudolfina! Santa Claus indeed is yet another popular excursion in Finland. Various places claim that Santa lives there, and you can visit him as a tourist of course! 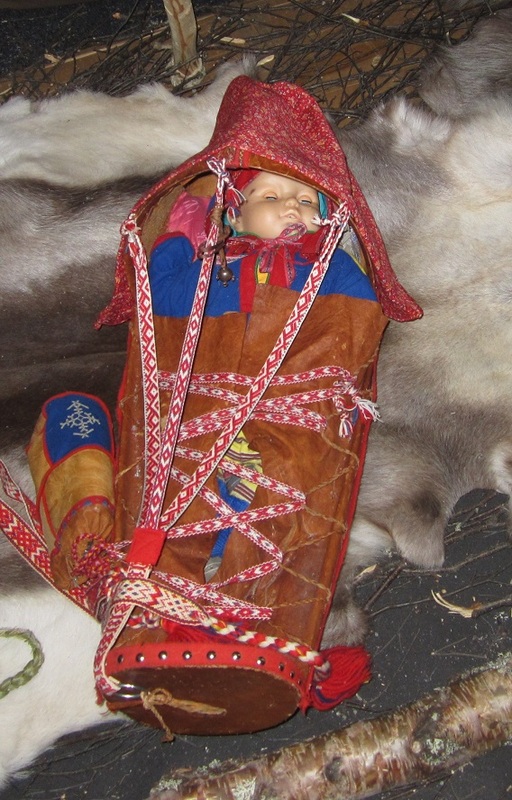 My quest for history and for the Sami, the indigenous people of Lapland, did not succeed. After a week full of excursions and impressions, we went back home, with wonderful memories of the stunning scenery of snow and the Northern Lights, but also with a nagging feeling. A feeling of remorse that I was one of those tourists who is causing such huge changes in a region that was once pristine inside the Arctic Circle. Now it is a lively resort with 43 ski slopes that transform an original mountain into a brightly lit amusement park, miles of trails and tracks for snowmobiles cut through the landscape and everywhere the roar of the scooters dispel the silence. And all the artificial light causes you now to seek the darkness 10 km further to see the Northern Lights properly. And tourism in Lapland, by definition, means that most of the tourists have to travel thousands of kilometers in polluting aircrafts. Yes, the people of Finland are entitled to earnings from tourism. And yes, I’m no better, because I too was curious to experience it all. Still, I raise my eyebrows at the new trend for seniors to make “bucket lists” of things they should do and see before they are gone. Especially if those buckets mean that you have a lot of traveling and so … to pollute. I speak for myself: My intention is to put in my last will above all, to leave money for organizations that are committed to sustainability and the preservation of native landscapes. 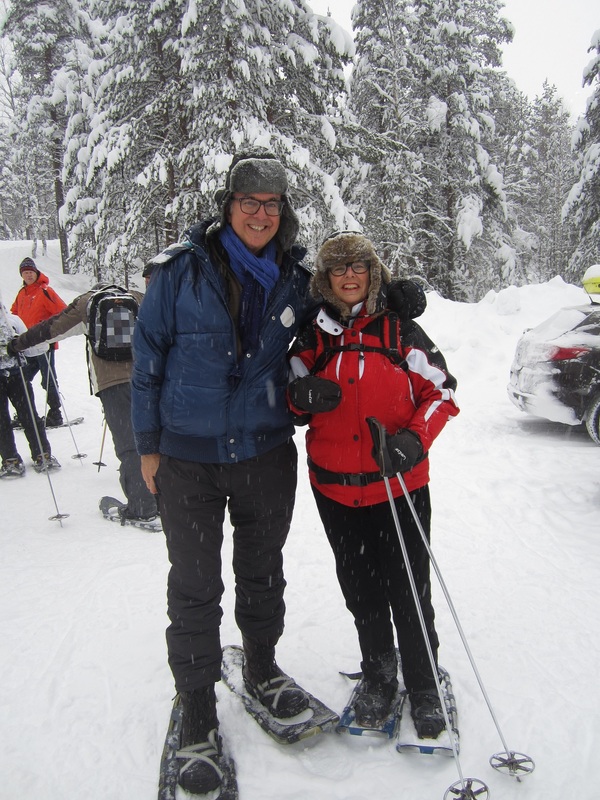 Our authors Aik and Ans on the snowshoe walk. 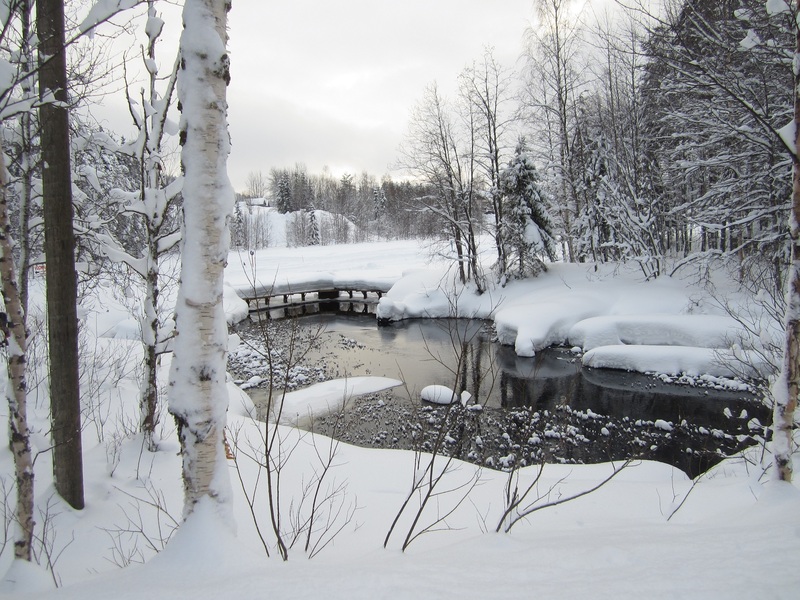 Editor’s notes: A big thank you to Aik Meeuse and his sister Ans for writing the story and sharing photographs of their Lapland adventure with Green News Update.